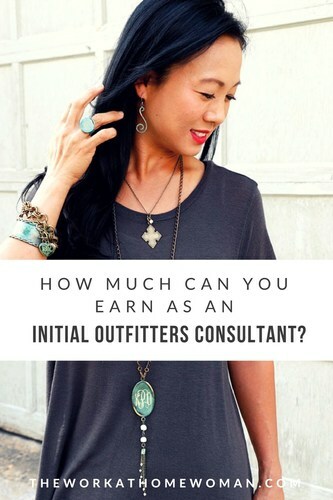 You are here: Home / Direct Sales / How Much Can You Make as an Initial Outfitters Consultant? This month I had the opportunity to take an inside peek into the company, Initial Outfitters. 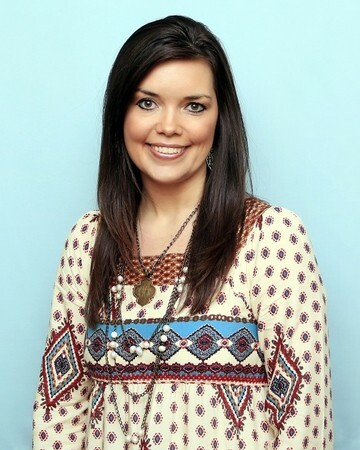 If you're not familiar with Initial Outfitters, they are a Christian-inspired direct sales company that sells personalized jewelry and gifts. Consultants can earn 20–35% commission on personal sales, plus the opportunity for team sales bonuses. But what makes Initial Outfitters different from other direct sales opportunities? Initial Outfitters is well-known for their wide array of jewelry. They have everything from classic to contemporary, and many of the pieces can be personalized for an extra special touch. But did you know they also sell a HUGE line of boutique-style gifts and accessories?! They literally have something for everyone. Their fall/winter catalog is enormous and contains over 90 pages of merchandise. They have everything from personalized kitchen and pet items to purses, home decor items, backpacks, and soft-sided coolers. Most of their items range in price from $12 – $89, plus an additional $5 to engrave jewelry and an extra $7 to embroider handbags. They also have some sterling silver statement pieces that range in price from $99 – $799 per item. This fall, I got to try out a bunch of items from the fall and winter line, including matching coasters and cutting board, the Harper Chevron Handbag, the Love You Backpack, the Blair Ring, and a piece off of their Ironworks Collection, the Oval Best Fringe Forever Necklace. Each piece was personalized; some with my initials and others with my last name. I actually can't wait to do some fall entertaining and display the beautiful cutting board as a cheese tray along with the matching coasters. However, I think the Harper Chevron Handbag is my favorite out of the bunch. It's the perfect size, it has lots of pockets, and it looks and feels likes leather. 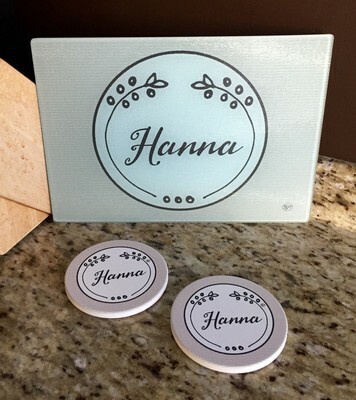 The items are well-made, and I love the variety of ways each item can be monogrammed or personalized with different fonts and colors of thread. Their line is well diversified, so it will appeal to a broad array of tastes and budgets — which makes it easier to sell. Consultants earn 20-35% commission on personal sales volume, plus and additional 7-14% commission when they build a team. Initial Outfitters has a solid party average; according to their website, it's reasonable to expect to earn an average of $150-$200 per party. As a Consultant, you can earn free product credits, jewelry, cash, or a dream vacation for meeting sales goals. Here are some of the basics of the home business opportunity. Starter kits range in price from $79, $129 and $199. Initial Outfitters pays Consultants once a month via direct deposit. There is a $10 monthly fee to remain active as a Consultant. There are no additional fees for your personal website. Consultants can sell through in-home shopping parties, catalog sales, and online. Consultants have the opportunity to earn 50% off items based on their personal activity. There are monthly hostess specials and incentives for individuals who host a party. Initial Outfitters puts out two catalogs per year, one in the fall and one in the spring. They also put out a mini Christmas Gift Guide in October — which gives you multiple opportunities to connect with your customers. Consultants are given extensive training when they join. They will receive daily training tips via email for the first 30-35 days. As well as, access to High Heel Camp and The Next Step Leadership training modules which guide Consultants through the basics of getting started. Conference calls are also held twice a month. Reviews from Initial Outfitters Consultants. I have always loved the “Home Party Plan” Industry. Almost 20 years ago, I found myself at my first home party and loving it! I was a new mom and needed a night out with the girls. I loved the fun, food, and shopping atmosphere associated with the home parties, so I decided to try out the business myself. I dabbled in a couple of different companies shortly after that. Fast-forward to 10 years later and after having our fourth child, my husband and I decided I would embrace being a stay-at-home mom. We were excited about the decision, but I began to feel guilty if I spent money on myself since I wasn't working. After a couple of years of being a SAHM, I began thinking and praying for a way to make some extra income so that I could have some “guilt-free cash.” In addition to that, I had a desire to be more involved in ministry. I was longing for more purpose in life, and after looking online for ways to make income from home, I found many opportunities; but Initial Outfitters seemed to stand out among the rest. It had everything I was praying for and searching for! I fell IN LOVE with the HUGE variety of products and of course the personalization aspect as well. I was so excited that I would have my own little traveling boutique and that I could offer women boutique style shopping that we all love! Since there are gift occasions ALL YEAR LONG (Christmas, Valentine's Day, Easter, Mother's Day, Graduation, Wedding Season, Back to School, etc. ), there's always a reason to have a party. Additionally, I loved how richly rewarding the hostess plan was (is). To me, this was very important because I knew that the hostess plan would help fuel my income potential. Because we can reward women handsomely for having a fun girl's night with their friends, it helps us to get more bookings, hold more parties, and share our business with more women which all increases our income. Most importantly, I love that every party I hold, I'm helping feed and do more for not only my family, but other women's families with whom I share this business with, and the children in poverty through our ministries. Initial Outfitters has a very rewarding compensation plan including once in a lifetime bonuses and rewards trips (which by the way I have earned). I can't tell you the joy and fulfillment it brings when I cash a monthly paycheck over five figures or earn an all expense paid vacation for my family while working from home and being there for my kids. IO has fulfilled so many of my heart's desires and has changed our family's lifestyle for the better. I am so blessed to be part of this company and love seeing others be blessed by it, too. A few years ago, my youngest had just left for college, and I found our nest feeling a little empty. A job with flexibility was important to me, so the direct sales model was a good fit. I found Initial Outfitters from a Consultant's post on Facebook and was immediately intrigued. The product drew me in because I had never seen such a variety of personalized items, and I started thinking that I could actually help others find unique gifts not seen anywhere. I decided to begin my journey with Initial Outfitters and have been beyond impressed with the character and guidance of our founders, the corporate staff, but most of all, the camaraderie between consultants. Also, our “IO Loves” partnership gives Consultants and customers an opportunity to give back and help those who need it most. No matter where I go, I'm always proud to represent Initial Outfitters. Initial Outfitters has an A+ rating with the Better Business Bureau, and they are a member of the Direct Selling Association. But besides having an excellent reputation, Initial Outfitters is a Christian-based company with a HUGE heart. With the Initial Outfitters' IO Loves program — 100% of the profits from the sale of lunchboxes goes to ministries that feed children, and 100% of the profits from the sale of backpacks goes to ministries that educate children in the US and abroad. Customers also have the opportunity to round up their order totals to donate to either of these charitable campaigns. My Review of Initial Outfitters. There are a lot of things I like about the Initial Outfitters opportunity — so let’s start with the obvious, the products. They have a TON of products which is good for appealing to a wide variety of styles and tastes. Their price points are diverse which makes it easy to fit into anyone’s budget ($12 – $799), and the personalization aspect helps bring up your sale average. I'm actually a very picky shopper, and there were a lot of items I was admiring, like their Generations Collection and their personalized coffee mugs to name a couple. The entry point to get started is affordable ($79 – $199), and you get a ton of great tools and support along the way. The commission structure and incentives are comparable to other direct sales companies, and the only recurring fees you’ll have are order forms, catalogs, your $10 monthly fee, and additional products (which you can purchase at substantial discounts or even earn for free). AND, there are no monthly sales or party quotas. Initial Outfitters is a highly reputable company, and I like how they give back to different ministries. So would I recommend Initial Outfitters? Yes, indeed! But with all of this said, to be successful in direct sales you need to have a passion for the products and you need to put forth the effort. If you'd like to find out more about Initial Outfitters, or if you want to sign up as a Consultant, go here. This post was sponsored by Initial Outfitters. Please be aware we only promote advertising from companies that we feel we can legitimately recommend to our readers. See our disclosure policy for further information. Hi Margaret, You can send them an email at info@initialoutfitters.com. Good luck and keep us posted! I am a Senior Outfitter Leader with Initial Outfitters and I love your review of our company! IO is an amazing company that I am honored to be a part of! We are growing and welcome these positive reviews! Have a blessed day! Glad you enjoyed the review, Connie! That’s great that you found a home business that fits your lifestyle, congrats!